Talk, as prepared, for TAFA 2014. When my wife introduces me, Anne points out that, as a speaker, I’m a very good writer. My “friend” Paul Shapiro has also noted I’m poor at prepared remarks, and says I should just stick to Q&A. But I want to cover just a few bits first before we open it up for discussion. OK, let’s get started. Everyone stand up. Now sit down if you don’t have all the answers, but want to learn more and get better at helping animals. Funny story: 25 years ago, I would have stayed standing. I thought I had all the answers. I had what I considered to be an air-tight philosophy. And with that and my “perfect” veganism, well, I figured I knew everything worth knowing. Of course, I couldn’t have been more wrong. Being “right” -- whatever that actually means -- doesn’t matter at all to the animals. What matters for the animals is for us to be effective. Another mistake I’ve made in my 25 years as a vegetarian was equating popularity with effectiveness. Especially in this age of social media and instant feedback, it is easy to think we’re being “effective” when we get a lot of “likes.” Individuals and organizations can easily get caught up in pursuing what is “cool,” what “creates buzz” with other vegans. But again, the animals don’t need us to be liked by fellow advocates. The animals need us to reach new people and convince them to take the first step to help. Kristie, Suzanne, and Erica have covered a lot of the why, what, and how of effective activism; specifically, how we can set aside our ego and pursue proven, effective actions that will make a real, lasting difference for animals. But before we go to Q&A, I just want to review the why and what on a somewhat broader scale. This graph, from our friends at Animal Charity Evaluators, shows the relative number of animals used and killed in the United States. As you can see, to a first approximation, every animal killed in the US is an individual killed to be eaten. Now compare that to this graph, also from Animal Charity Evaluators, showing the money contributed to animal causes in the United States. Now, farmed animals are represented by the tiny strip in the lower right. Clearly, there’s a disconnect between the number of animals suffering and dying in different areas, and the amount of money and attention given to them. To me, this is compelling. This was the information that totally changed my view of the world and my approach to advocacy. 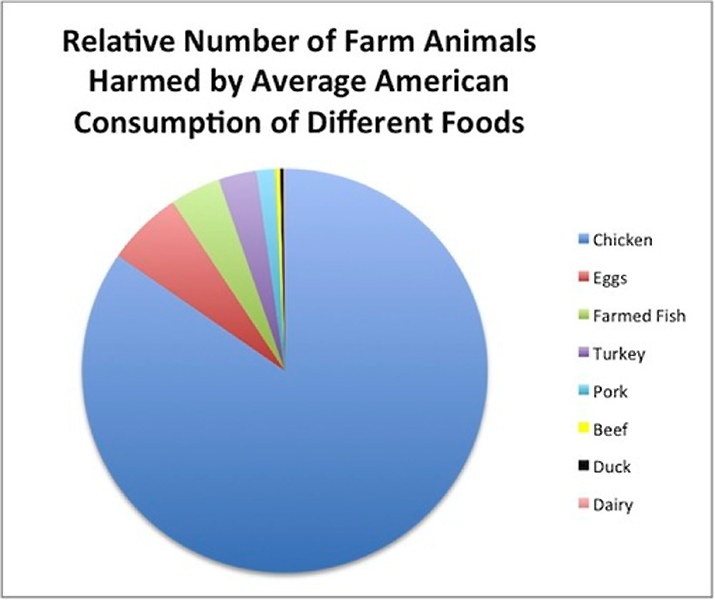 This graph, based on data compiled by Ben Davidow, breaks down the farmed animals harmed in the US each year. 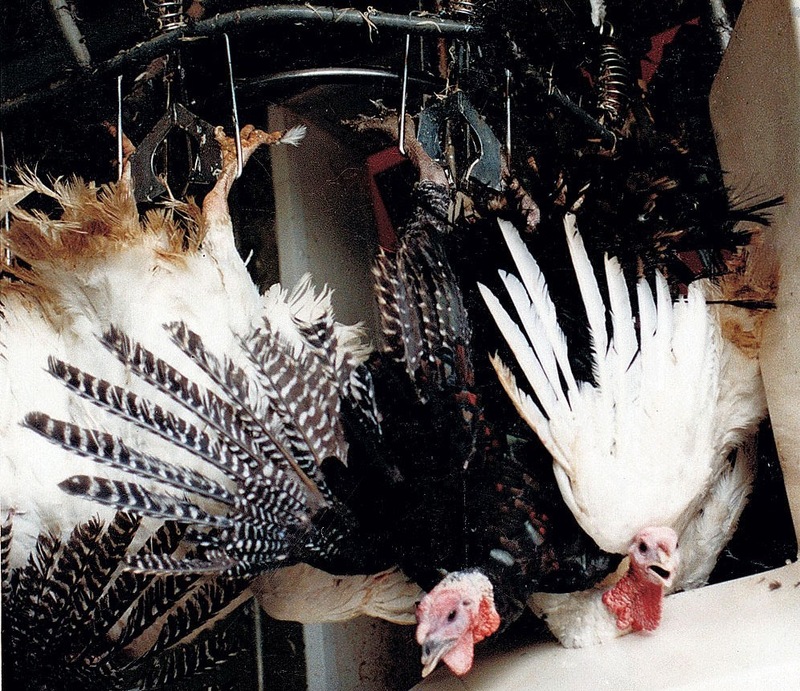 If nearly every animal killed in the US is a farmed animal, nearly every farmed animal harmed is a bird. In my experience, there is still somewhat of a disconnect between what farmed animal advocates focus on, and the relative number of animals harmed. Now of course, it is entirely understandable that we focus on the animals we like best. For most people, this is dogs and cats. It is also entirely understandable that we, as advocates, focus on cruelty that most disturbs us; for most farmed animal advocates, that would be mammals, especially dairy cows and calves, not birds. Obviously, many factors go into deciding how to utilize our limited time and resources. But with this information, all of us concerned with helping animals might want step back and perhaps reconsider our advocacy. Most of us want to convince other people to rethink their view of animals, and reconsider what choices they make. It may be advantageous for us to do the same. That is: we might serve the animals better if we were to consider these relative numbers and rethink our choices. By doing so, it is possible we could make an even bigger difference for the animals going forward. On a personal note: I want to thank you all for your commitment to the animals. I know that since you are here at this discussion today, you have already moved beyond the immediate and familiar, and are dedicated to making real, fundamental change. It has been an honor to be a part of this work with you for 25 years now. I have known some of you almost my entire adult life. I have learned so much from so many of you. I’ve cried and mourned with you, and I’ve laughed and celebrated with you. Working for the animals with you has given my life true meaning. I hope to work with you until this work is no longer necessary. Thank you.